Get the consolidated, holistic insight you need to more effectively optimize communication workflows, reduce clinician interruptions, identify root causes of sentinel events, and achieve clinical imperatives for improving patient care. Vocera Analytics, a core feature of the Vocera platform, is a monitoring and diagnostic tool that provides visibility to all traffic that goes through the Vocera platform. It can help you optimize usage and adoption of Vocera technology, demonstrate ROI, and proactively identify infrastructure issues. 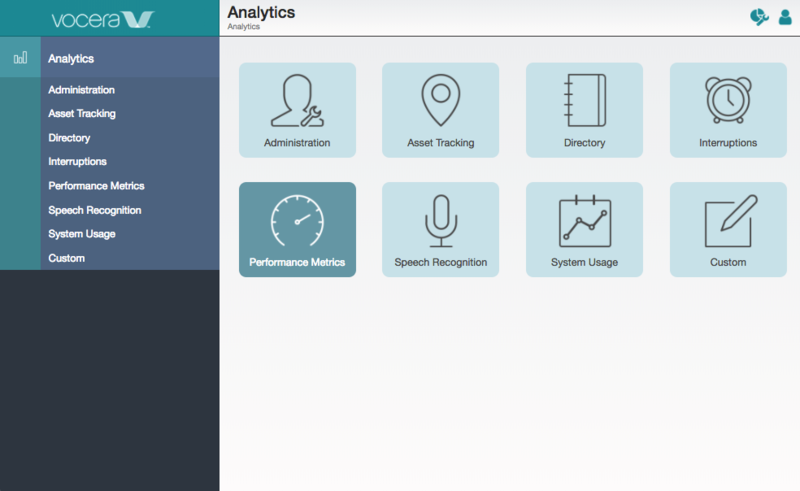 Easily navigate dashboards and tools with a simple, intuitive user interface. Reduce clinician interruptions: Identify the frequency and sources of interruptions from phone calls, broadcasts, texts, notifications, alarms, and alerts. More effectively manage clinical communication workflows and processes: Pinpoint issues or gaps in call flows and workflows to identify areas that need to be adjusted. Identify delays in response to alerts, alarms, and code calls and optimize escalation paths. Identify root causes of sentinel events faster: See the full picture of interplaying factors in one place, rather than compiling information from multiple systems. Proactively identify infrastructure issues: Spot potential software and hardware issues in near-real time. Optimize usage and adoption of Vocera technology and help demonstrate ROI: Track usage trends for all Vocera software and traffic from clinical and operational systems integrated with the Vocera Platform. The Vocera Platform is the core of every Vocera solution. It is an operating environment for a set of systems, software, and communication devices. Get real-time situational awareness with critical patient information and immediately collaborate with care teams. Instantly connect from anywhere with the right person simply by saying the name, function, or group name of whom they want to reach.